This detailed volume compiles state-of-the-art protocols that will serve as recipes for scientists researching collagen, an abundant protein with great importance to health and disease, as well as in applications like food, cosmetics, pharmaceuticals, cosmetic surgery, artificial skin, and glue. Beginning with a section on in vitro models for the characterization of collagen formation, the book continues by highlighting large-scale analysis of collagen with mass spectrometry in order to elucidate the proteomics, degradomics, interactomes, and cross-linking of collagen, high resolution imaging approaches for collagen by the use of scanning electron microscopy and multiphoton imaging, as well as the role of collagen during physiological and pathological conditions. Written for the highly successful Methods in Molecular Biology series, chapters include introductions to their respective topics, lists of the necessary materials and reagents, step-by-step, readily reproducible laboratory protocols, and tips on troubleshooting and avoiding known pitfalls. 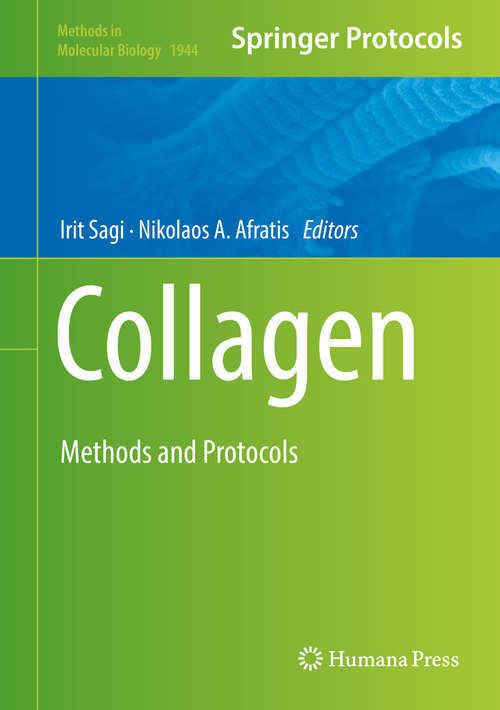 Authoritative and practical, Collagen: Methods and Protocols is an ideal guide to high quality and repeatable protocols in this vital field of study.